Ben Wirth of benwirth licht: "Cluster+ is a system which, thanks to its modular concept, can be assembled in lots of different ways. It consists mainly of three or four components: the supporting material (PCBs), binders, the OLED modules and LED components. With Cluster+, the two promising illuminants, OLED and LED, are used with all their technical benefits and are ideally combined into a system. This is intended to provide customers with the option of customizing their own lighting solutions. As a result of multiple addition of the same element, an abstract, organic model is created." The Munich-based designer Ben Wirth took advantage of the modular lighting system Cluster 2.0 for an innovative and impressive lighting system at the ”Belvedere” installation in Vaduz (Liechtenstein). Belvedere is the name of the new headquarters of the First Advisory Group. The modular luminaire system “Cluster” was already rewarded in 2010 with the Design Plus Award. For different application needs the lighting system can be equipped either with OLEDs or LEDs. In the case of the Belvedere installation the luminaire modules were assembled in different assortments to fulfill the specific lighting tasks. 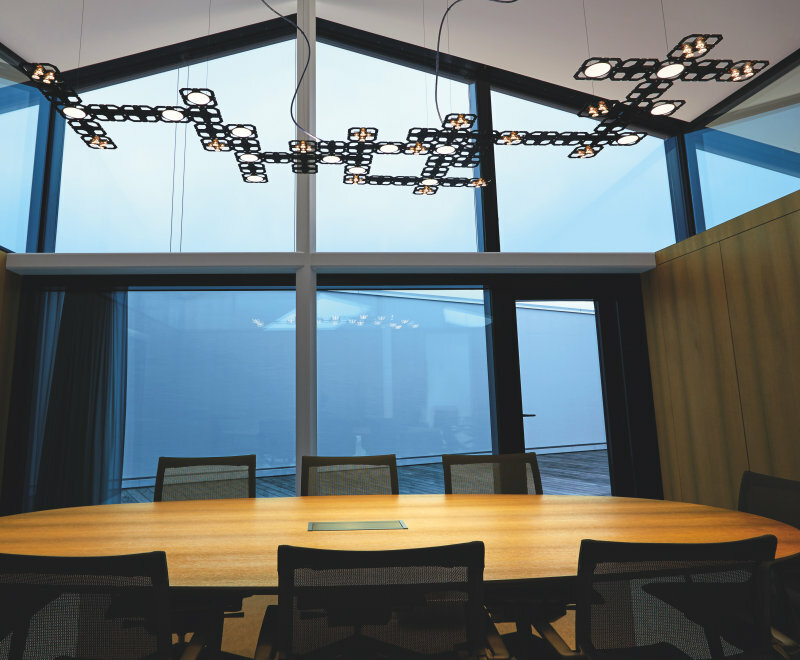 For example the pendant luminaire in top of the conference table of the boardroom provides a pleasant illumination. A total of 800 of the 12.5 x 12.5 cm modules where used for this installation. 200 of these modules are equipped with the ORBEOS CDW-030 OLED panels. Reference project: OLED installation "Bodi"
The longterm good relationship with Munich designer Ben Wirth has led to another impressive project. 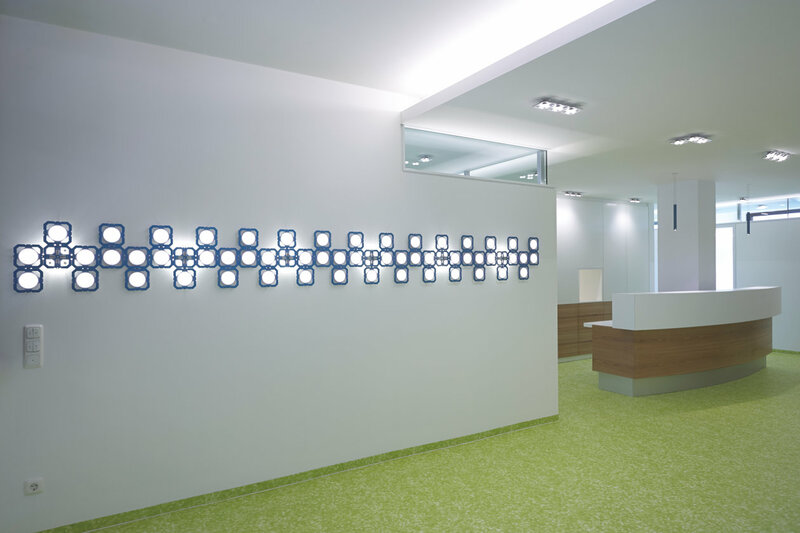 Having already received the design plus award in 2010 for his modular “Cluster” OLED luminaire, a new installation in a medical practice near the Harras in Munich provides now atmospheric lighting. Before this project the “Cluster” luminaire has already been upgraded with an improved second generation of OSRAM OLED panels. In collaboration with the architects by Munich based kip-architects, an innovative lighting system including 56 CDW-030 OLED modules and 6 LED modules over a length of 3.75 m was developed. In the course of this, the warm-white and glare free OLED elements have been installed on the wall of the waiting room in the shape of a broad ribbon and can provide a relaxing atmosphere with a soothing light control.